Tripoli Tavern, originally uploaded by sogrady. Introduction: While I’m enough of a fan that I actually move back East each summer just to be closer to the mecca that is Fenway Park, even I can’t manage to be in Boston for every game. So get off my back about it. Anyway, with Red Sox nation being as populous as it is belligerent, it should come as absolutely no surprise that expat fans all over the globe have banded together to collectively anoint certain drinking establishments as “Red Sox” bars. Whether this occurs with the consent of the owners of said establishment or is more of a hostile takeover is ultimately irrelevant, as far as I’m concerned. All that matters is that there exist, for the serious and dedicated fan, virtual embassies or oases for Sox pilgrims that regrettably find themselves far from home. Over the coming months we’ll review some of the favorites here so that you unfortunates that are abroad know where to watch the game with people just as angry as yourselves. If you have your own suggestions or reviews, don’t be shy: you know where to find me. Normally I impose strict restrictions on travel during the playoffs, unless of course it’s to Boston (as it was for Game 3 of the ALDS). For Game 1 of the ALDS, however, I made an exception and agreed to travel to Chicago for a conference. Not because the client requested it, but rather because it meant that I’d be able to watch the game with my buddy Napes who’s strayed far from his New England roots and now calls the Windy City home. Blasphemous, I know, but he’s a good guy otherwise. Anyway, Napes’ suggestion for our venue was the Tripoli Tap, located in the scenic and confusing as hell Lincoln Park neighborhood of Chicago. As suggestions go, this one was a winner. Many Red Sox bars are nominal in their affiliation with the club: a couple of signs here and there, maybe a jerseyed employee or two, and that’s about it. The Tripoli Tap was and is a Sox bar top to bottom. 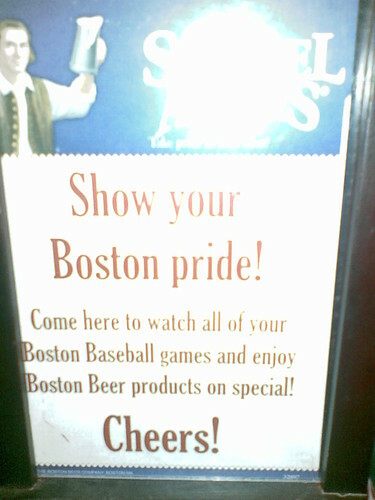 First, the signs: there’s nothing understated about their affection for Boston fans. Second, the staff: they can’t pronounce their R’s, which is always a good sign, but it gets better. For Game 1 of the ALDS several of the bartenders were decked out not in the obvious jersey, but far more subtle t-shirts dating back to the 2004 playoffs that were adorned with the phrase: “Why Not Us?” If you weren’t a fan, you probably didn’t get it. We all got it. Given that Beckett was dealing on the particular evening in question, I have absolutely no recollection of the quality of the food, but what are you looking for: a Sox bar or a five star restaurant? What’s important here is the fact that they have cold beer, and that your fellow patrons are extraordinarily likely to be members of the same faith. Which means the Tripoli Tap is always a good time. Unless the Sox lose, in which case I’d keep your head down.